The 2017 Great American Solar Eclipse as it was seen from Oregon: One study shows that this eclipse inspired U.S. adults to learn about science to a greater extent than any other similar event. The Great American Solar Eclipse ignited exceptional interest in science among the U.S. public, according to one new report. Last summer, it seemed like everyone was obsessed with the solar eclipse. People scrambled to get their hands on eclipse glasses, shared articles about the event and brought up the eclipse in what seemed like every conversation. 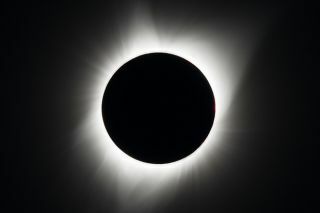 In the final report of a survey led by the University of Michigan, researchers found that U.S. adults who watched the 2017 total solar eclipse gathered information about the phenomenon about 16 times in the three months following the event. "What we found was that there was a substantial amount of people going online, going to libraries, talking to their friends, trying to figure out what was going to happen with the eclipse before and after the event," Jon Miller, director of the International Center for the Advancement of Scientific Literacy at the University of Michigan's Institute for Social Research who lead the survey, said in the statement. "To a large extent, scholars have watched what people do before a scientific event but not what they do after. The event can be a stimulus that causes people to look for more information." The Great American Solar Eclipse as seen from Wyoming: You can see a solar flare on the upper right quadrant of the sun. This event sparked a nationwide boom in scientific interest, with people talking about the eclipse, searching for information about the event, and reading stories and articles about it. According to the report, in addition to seeking information at a higher rate than for other science events, the average U.S. adult had eight conversations about the eclipse. On average, adults in the U.S.searched online twice for information about the eclipse in the two months leading up to the event, and they read stories about the event in magazines and newspapers, both in print and online, according to the statement. The most common way that people searched for information about the eclipse was through conversations with friends and family. In second place was through reading articles and stories about the eclipse, according to the statement. This survey information was gathered from online and telephone interviews with 2,834 U.S. adults before the eclipse. Of the initial people surveyed, 2,175 responded to a follow-up survey directly after the event, and 2,212 responded to a third survey three months after the eclipse. In addition to this survey's findings, NASA reported a record number of visits to its website. The agency publicly stated after the eclipse, on Aug. 24, 2017, that "with more than 90 million page views on nasa.gov and eclipse2017.nasa.gov, we topped our previous web traffic record about seven times over." In fact, people in the U.S. were so excited by the eclipse that it even outperformed the nation's biggest sporting event; almost twice as many U.S. adults watched the 2017 solar eclipse (in some fashion, whether online, on TV, or in person) as the 2017 Super Bowl. "This level of public interest and information-seeking about a science-oriented event is unparalleled," Miller said. "It suggests that groups and organizations interested in fostering increased adult interest in science should think about post-event programming to provide resources and a forum for these discussions."